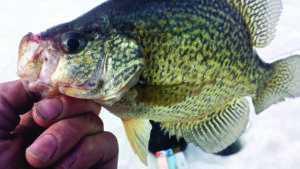 A new ice-fishing season is upon us, and with the arrival of this year’s layer of hard water comes new opportunities for adventure, fun and fishing success. Even though I may fish across the Midwest in pursuit of different species and unique fishing scenarios while filming Larry Smith Outdoors, I spend a tremendous amount of time, both guiding and exploring, on the system that I like to call home: The Winnebago System. One of the biggest factors that affects both the location and health of Winnebago fisheries is forage. Forage levels, particularly shad, have been low across the system for the last couple of years due to relatively cool summers that have prevented a good hatch of young-of-the-year shad. That being said, the upriver lakes of Butte des Morts and Poygan are shallower than Lake Winnebago, and tend to have better forage hatches during cool years. This is because the shallower water will warm faster, and hold these warmer temperatures for a longer period of time than the main lake. A key factor that you need to understand, especially when it comes to walleye and white bass, is that they will migrate great distances to find food. When forage is scarce in Lake Winnebago, a large number of fish will travel upriver to take advantage of the higher bait fish levels. Thankfully, this year we were fortunate to have higher temperatures during the summer, which has resulted in good hatches of shad throughout the system. I noticed many good pods of bait both upriver and in Lake Winnebago during my trips this fall, and the fish have a nice, stocky build to them, which is a great sign of an increased forage base. Now, those of you who know me, have fished with me, or have been watching Larry Smith Outdoors on YouTube, know that I am very conservative when it comes to harvesting fish. I firmly believe in letting the larger fish of all species go to maintain healthy spawning stocks. 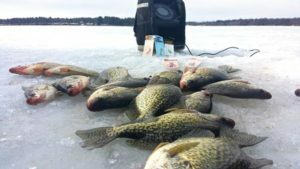 As many of you know, ice fishing on the upriver lakes, especially Poygan, has been very good the last couple of years due to the lack of forage on Lake Winnebago. Since so many fish have migrated upriver away from the vastness of the main lake, the fish have been in a proverbial “barrel.” Harvest levels have been extremely high due to incredible pressure, reports on social media, and the advancement of fishing technology. Something that I have noticed, besides the harvest of larger fish, is that anglers will keep MORE and SMALLER fish during the ice fishing season than any other time of year. I recently had a conversation with one of our fisheries biologists about this phenomenon. He said that, without a doubt, the highest harvest rates occur during the ice season. Fish that would have undoubtedly been released any other time of year are kept during the ice season. I’m not sure why the standards of some anglers change during this time of year. Our conversation turned from there to panfish limits. Now, I’m sure there will be a lot of you that are going to want to fillet ME for what I’m about to say, but I feel Wisconsin’s panfish limit should be reduced to 15 per person. Before you guys get out the torches and pitchforks, hear me out. Say you take your son and daughter out for a fishing trip in pursuit of perch, bluegills and crappies. With a 15 fish limit, you could keep 45 fish between the 3 of you. That amounts to 90 fillets, which is plenty to feed you, your kids, your wife, your aunt Betty, her husband and a few of their friends. When you think about it this way, 15 fish seems like more than enough for a personal limit. But enough of the soapbox, on to the technique. 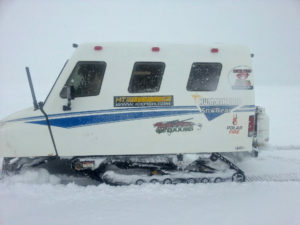 When fishing Winnebago, there is nothing like running and gunning out on the open ice. I love the wide-open spaces, ice and snow dunes for miles, the crisp air, and the possibility of finding a mother lode of fish, miles from another angler. A big part of the excitement, for me, is the hunt. When searching for active fish, I drill a set of holes, then use my flasher to mark them. I love using Acme Kastmasters to bring fish in from a distance. Its flash and vibration grab the attention of roaming walleye, crappies and white bass bringing them in for a look. If I’m not marking any, I typically will move 400 to 600 yards, drill and start searching again. I’ve always said that the key to success on Winnebago is to tick the fish off. It is definitely a reaction strike that gets most of the fish on this body of water. The more fish I can bring in on my sonar and have them layer underneath my Kastmaster, the better chance I have to catch them. Once I have their competitive juices flowing, the key is to constantly keep the bait just out of reach; pausing only for a split second when a mark comes up out of the main school in an attempt to trigger that fish into biting. Some days you have very active fish that are extremely competitive and come charging up at the bait, maybe two or three at a time; other days you really have to use finesse. A good rule-of-thumb; the lower the activity level of the fish, the smaller the Kastmaster. Typically, you don’t need to tip the Kastmaster with live bait, but on really tough days I will occasionally use some spikes to sweeten the deal. Mobility is very important when fishing the largest inland lake in the state of Wisconsin. As much as I love to use tip-ups, I save them for other bodies of water where I’m not constantly moving to stay on active fish. Speaking of mobility, I’ve found that the new Beaver Dam Tipsticks have added a new dimension of versatility to my constant hunt for fish. The adjustable tip allows me to work a variety of different sized baits and impart different actions on them depending on where I have the tip set. For example, I can take a 1/8 oz. Kastmaster and give it a “mushy” action with the tip fully extended, or I can give it a crisp “pop” and “flutter” with it retracted. This essentially gives me the actions of a few different rods in one. The added rattle-handle lets me really call fish in from a distance in dirty water! 1) Don’t go alone. It’s always safer to go with a buddy or group. Let someone know where you are going, out of what launch and what time you estimate you will be back. Communication is the best thing you can do to keep you and your group safe. 2) Carry ice picks. In the unfortunate event you were to go through the ice, stay calm and use your picks to climb out onto more stable ice. Picks are arguably the most important ice safety item you can carry. 3) RESPECT THE ICE. There is no such thing as completely safe ice, so therefore we must use extreme caution each and every time we are out. Stay informed of constantly changing conditions. Those unfamiliar with the ice should also not be opposed to wearing a PFD or purchasing a floatation ice suit. There is also a great product on the market called a NEBULUS emergency flotation device. This revolutionary safety device can be attached to an ATV or snowmobile, and will provide flotation for up to 1000 lbs. in the event of a breakthrough. The cost is around $500, but considering the cost of your ice equipment, ATV, and the irreplaceable value of the lives of your loved ones, it seems like a very, very small investment. Check it out at www.nebulusflotation.com. Time on the ice is a great experience. It helps break cabin fever, gives kids and the family dog room to run, and allows us an opportunity to catch trophy walleye, pike, crappies and perch. It also allows us to enjoy a meal of fresh fish, if harvested wisely. Who doesn’t like a fresh winter fish fry? Just remember; you don’t need to limit out to be successful, release those fish that need to grow a little bit longer, and when it comes to those fish that are so big they make you think, “It’s a great day to be alive!” let them go. Their life is the reason you thought that in the first place. Have a great season everyone! Larry Smith is a full-time fishing guide and outdoorsman in Wisconsin with 30 years experience. He specializes in ice fishing on The Winnebago System, Petenwell Flowage, and many other major Wisconsin waterways. He is also host of Larry Smith Outdoors, a new outdoor television show featuring adventures from across the Midwest. Like Larry Smith Outdoors on Facebook, follow him on Twitter, and subscribe to his YouTube channel for the latest videos. Visit www.larrysmithoutdoors.com for network broadcast times in your area.